While professional caterers have a good knowledge about all things food, what’s in season at what cost, the average person tends to be more clueless. As a result, caterers need to use a catering quotation template that can be understood by all, i.e potential clients. From the client side, a request for quotation of catering services indicates a desire to either keep track of expenses, or to make comparisons with other catering services for similar services. Remember that the key to staying competitive is to give your client flexible prices. The quotation format for food items should thus indicate, when necessary, why certain food prices are at a given price. This would give your potential client the flexibility of switching to a more budget friendly option in the event he or she isn’t aware of the foods in season, which tend to be less costly. This way, you get to retain a client instead of being rejected for a competitor. In its barest form, a sample quotation for food supply breaks down the costs of food per person. This gives the client the knowledge about the caterer’s ability to either meet or exceed menu guidelines. Clients thus have the option of requesting a slightly higher or lower quantity per person, based on the resources available to them. Catering quotation sample letters are more of a follow up. It’s usually created after a preliminary meeting with a prospective client. The details enclosed are based on what this prospective client has indicated. Of course the letters also notify the client of other charges that may be incurred if certain additional services are requested. Quotation formats for food canteens, although cater to more people on a regular basis, tend to take into consideration the fact that these canteens already have some of the decors or don’t need the decors, that other events require as complementary to the full service. There’s also no need for waiting staff, so the quotation for this, differs slightly than other event quotations. Since they’re often for longer duration, discounts are sometimes offered, if services are continued. 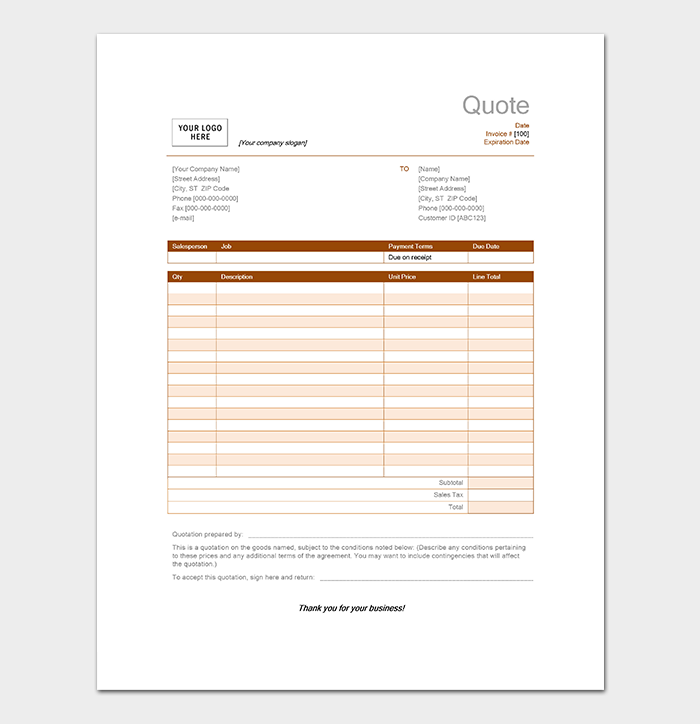 Why Use Catering Quote Templates? From a glance, catering for different functions may seem quite different. It’s always important to remember that at the very core, their aim is to list prices in an easy to understand and transparent format for the prospective client. To avoid making beginner’s error, samples of quotes are easily obtainable in pdf formats for comparisons regardless of the catering function.